Natural extracts, essential oils and Neem help keep your mouth healthy. Made with extracts from the bark and leaves of Neem, the Ayurvedic "toothbrush", this mouthwash helps reduce acids and buildup that can damage teeth and gums. Calendula, Sage, and Aloe soothe gums. 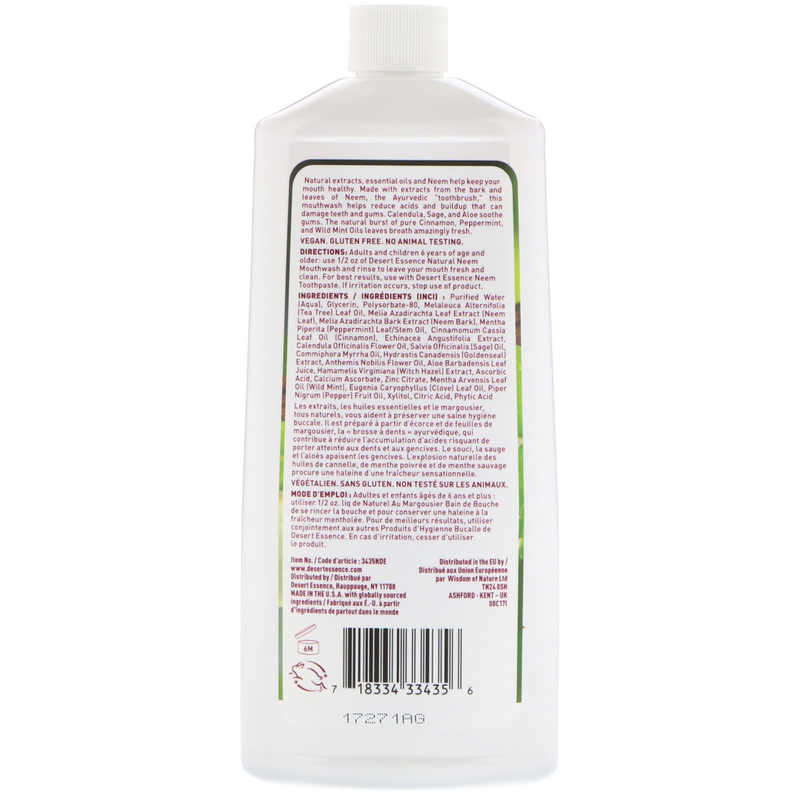 The natural burst of pure Cinnamon, Peppermint, and Wild Mint Oils leaves breath amazingly fresh. 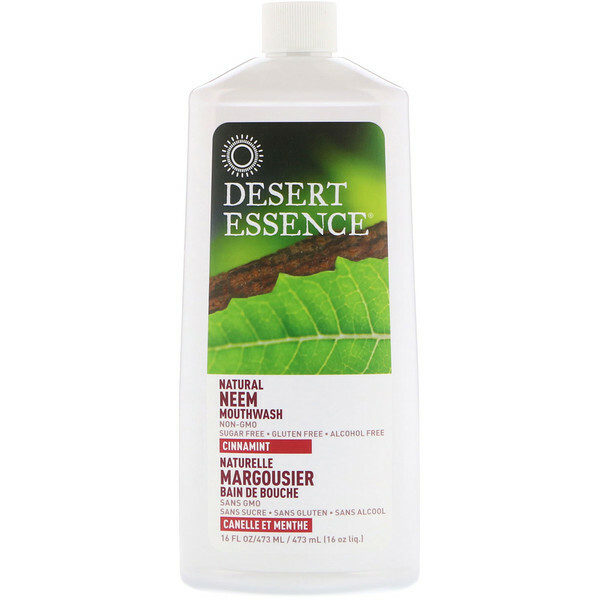 Adults and children 6 years of age and older: use 1/2 oz of Desert Essence Natural Neem Mouthwash and rinse to leave your mouth fresh and clean. 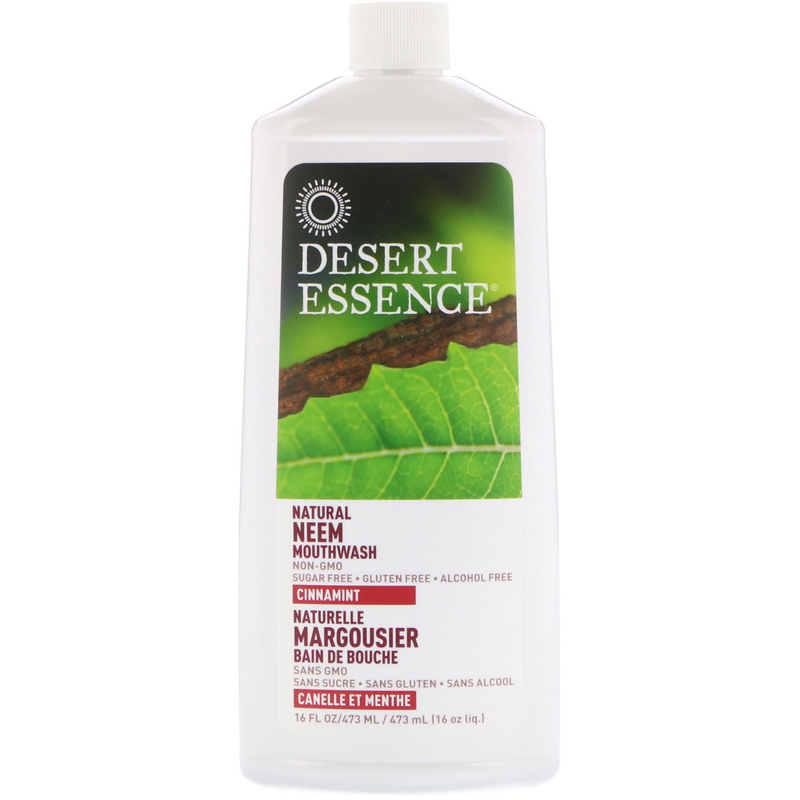 For best results, use with Desert Essence Neem Toothpaste. Purified water (aqua), glycerin, polysorbate-80, melaleuca alternifolia (tea tree) leaf oil, melia azadirachta leaf extract (neem leaf), melia azadirachta bark extract (neem bark), mentha piperita (peppermint) leaf/stem oil, cinnamomum cassia leaf oil (cinnamon), echinacea angustifolia extract, calendula officinalis flower oil, salvia officinalis (sage) oil, commiphora myrrha oil, hydrastis canadensis (goldenseal) extract, anthemis nobilis flower oil, aloe barbadensis leaf juice, hamamelis virginiana (witch hazel) extract, ascorbic acid, calcium ascorbate, zinc citrate, mentha arvensis leaf oil (wild mint), eugenia caryophyllus (clove) leaf oil, piper nigrum (pepper) fruit oil, xylitol, citric acid, phytic acid.